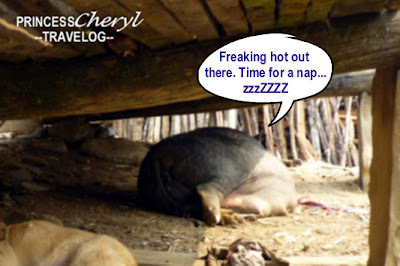 Princess Cheryl's thought of the day:- Continue blogging on my Vietnam vacation in San Jose... Weather is freezing cold and windy. Start suffering skin problem especially my face... However I'm excited over tomorrow -- shopping day!!! Fansipan or Fan Si Pan (Phan Xi Păng in Vietnamese) is a mountain in Vietnam, the highest in Indochina, at 3 143 m. It is located in the Lào Cai province in Northwest Vietnam, 9 km southwest of Sa Pa Township in the Hoang Lien Son Mountain Range. Fansipan is dubbed "the Roof of Indochina"; it is to be approved as one of the very few ecotourist spots of Vietnam, with about 2,024 floral varieties and 327 faunal species. I know climbing Mt. Fanxipan sounds demanding. And you may thought that we did hiked the highest peak in Indochina, actually we didn't. I know the first photo was sort of misleading. We did 2 trekking trips in Sapa, this is really a breakthrough for me as I'm definitely NOT a hiking "kaki" (everyone knows that). And surprisingly I did not complained at all but I rather enjoyed the half day trekking trip. 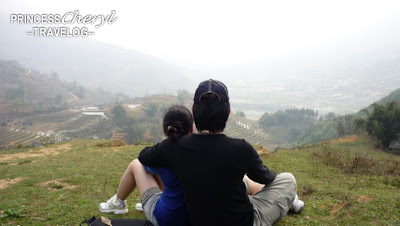 It was only 6.30am when we reached Sapa Town and checked in at Cat Cat View Hotel. It's been so long that I've never seen a sunrise as beautiful as this one. The morning sunlight brushed across the sky -- althought it's not twilight, but it still looked so magical. There we were on the roof top cafe of the hotel after checking in, waiting for a scrumptious breakfast treat. I really needed to fill up my stomach as it's been growling since 4am when we were still in Livitrans Express. Sapa at 7am...we were shivering while breathing in the cold and misty weather. Part of Fanxipan had vanished in the mist (white portion of the photo). Cat Cat View Restaurant. No cats around. "Cat Cat" actually means the waterfall in Viet. Mesmerizing for a moment before my breakfast was served... I'd make my roof garden look like this. Phở Bo for him. Phở is a signature dish that must not miss if you go to Vietnam. Juicy sliced beef in broth simmered with beef/chicken bones and oxtail, garnished with a lot of green and white onions. The noodle tastes just like our "koay teow" or "hor fun". I still miss this!!! French baguette (more accurately, Vietnamese baguette) or Bánh mì and omelette for me. My Viet friends used to say, the best thing that the French brought to Vietnam is the baguette. Hahah...I think it's true. I don't fancy bread but I really love the baguette. After breakfast our journey began. Thinh was our guide of the day (all our Viet friends either open travel agency or work as freelance tourguide) then lead us to Cat Cat Village. This was just a warm up 5km trek before the 12km trek for the next day. The Hmong girls were already out to town for business. Most of them sell handmade bags and ornaments as a living. Thinh (in red) was busy explaining the routes in front while we were busy snapping photos at the back. Marvelous Mt. Fanxipan, isn't it? It's spring thus half of its view was blocked by the mist. More and more Hmong girls came out of their village to the town. Where had the Hmong guys gone? Entrance to Cat Cat Cultural Village. Sounds commercialized already...not really good. Guess what appeared the most frequent all along our journey? The Black Hmongs, that's of course normal, we're at their village. Then water buffalos, that's normal too. A rice field without water buffalo is abnormal. But...what the heck these pigs do in a rice field?! Honestly I've never seen so many pigs running around freely in a village, well, I mean in our country, the pigs are caged and fed and then wait to be slaughtered. Pigs in Sapa are absolutely FREE from being caged!! FREEDOM!! I think all the pigs would migrate to Sapa if they want to be free from becoming food. Not totally but at least you get only the chance of maybe 5 out of 100 to be hunted for grand occassions servings say twice per year. How safe to be there huh! While the human are busy working, the pig is busy having a nap... No worries of needing a slimming course. Time for a little handicraft shopping. These were carved from the soft stone (I think it's lime stone but the local called it soft stone) of Mt. Fanxipan. See how dedicated were the Hmongs at work. Handicraft is always priceless due to dedicated time and skill to finish a masterpiece. But these people have no choice but to sell at a cheap price because of poverty. One of my favourite - the Chess Set!!! I've seen those made of crystal, jade, marble and wood in some gift shops, but not this one. I asked him how long did he take to finish this one, and the answer is more than 2 weeks!!! Selling at only less than 20USD...that is really worthwhile!! However, we're only able to grab a few small ones because we had just completed a quarter journey of our trekking. Will be much troublesome to bring along fragile handicrafts for trekking. Food preservation. No fridge for keeping food thus need to either smoke or dry the food. I suddenly missed Haagen Daz, Baskin Robbins and Swensons so much...how lucky we are to be able to enjoy food we love. Only very few houses own a fridge, usually the richer ones that open a grocery shop or coffee huts. And I was trying to demonstrate how to mill the grains, not easy though, need some technique to move the thing. And the journey continued, we walked passed another few rice fields before reaching the famous waterfall where this Cat Cat Village was named after. So there we were at the hanging bridge of Cat Cat waterfall. The little cottages built here are exactly like the drawings we used to see in jigsaw puzzles. Blue sky, cozy weather, running water down the streams, bridge connecting two sides of the stream, and nicely painted stone cottages. "Buy from me...buy from me..." This is what you'll hear all the time in Sapa. She's become the 'model of the day' of Cat Cat Village because the tourists actually queued to snap a photo with her. Me too... Doesn't she has a sweet smile? Off we went and continue our journey after 20 minutes rest at the waterfall. It's not that easy to become a tourguide in Vietnam. Thinh said he always had to come here at least once per month. $$$ is not easy to earn!!! Tourguides in Vietnam have really good stamina. ...while I talked to the 7-up... nah just kidding. Life is always simple and happy in Sapa, I guess so. Never tried having a picnic lunch before. Then only I realized...IT'S ALREADY NOON MAN!! Weather was still windy with a little mist that's why we didn't notice that it's already 12pm. 10 minutes after I sped up my steps on the steep road uphill. I was suffocating... Time to take a short cut! Right then a Hmong guy walked passing by, WITH A SACK OF POTATOES ON HIS SHOULDER!! And look at how easily he ran up the hill... Hey there, can you just pull me up?? Ok, now I see a short cut. Thinh was running all the way up! Hey...I felt like losing balance!!! Help me. I dare not even think of the possibility of a miss step that lead me rolling all the way down...my legs suddenly became weak. May I know how many days you've been there? Hi sk, I spent 2 days in Sapa.